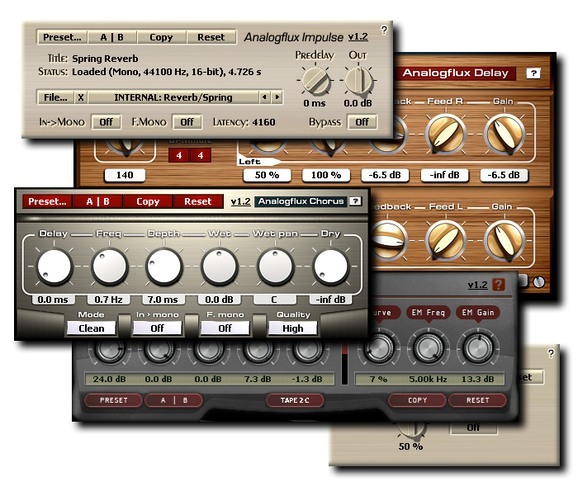 Analogflux is a suite of audio processing plug-ins designed to deliver the sounds of the analog days. In the core of these processors we have extensively used convolution processing to match the response of the original analog gear. This suite consists of TapeBus, Delay, Impulse, Insert and Chorus plug-ins. Fixed problem with the "Reset" button: previously it caused an incorrect "EM Freq" parameter behavior. Posted by Hamdygoo on Sat, 10/13/2007 - 01:12.